FAQ: How is this Higher Self Healing able to work? Imagine that each day of your lives - past, present, and future - is a coin. If you saw all these coins stacked one on top of another from the side, you would see a long roll of coins stretching out before you. If you viewed the stack from the top and looked directly down at it, you would see only one coin. As human beings, we experience life from day to day (or from life to life) as if we were on the side of that long roll of coins. We move from one coin to another. Those coins behind us we call the past. Those coins in front of us we call the future. The coin we are now occupying we call the present. Time seems to move along a linear path with one coin leading to the next. As spiritual beings, we experience all our lives as if we were looking down on the stack of coins, seeing through them, and seeing all of them at the same time. Time does not move but is instantly accessible as the infinite NOW. Since all time is NOW, the coin at the bottom of the stack (the NOW of a past life) is as easily accessible as the coin at the top of the stack (the NOW of a future life). When you (in the now) are sending healing back to one of the "you coins" earlier in the stack (in this life or in past lives), you are doing so as a spiritual being in the human consciousness. When you gain access to that point in time where the issue arose, the knowledge you gain allows you to heal the broken part of that "coin". Once the broken part is healed, it effects all the rest of the "coins" that follow it. Healing the past (whether in this or other lives) then flows through the stack of your lives to resolve your present and empower your future. If YOU are Dreaming of More Abundance. If YOU Want to Experience More LUCK. 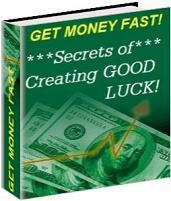 Get the Secrets of Creating Good Luck!